Sierra Leone's present is defined by its tumultuous past. A decade-long civil war has left 70% of the population living below the poverty line, and many people are still struggling to escape dire circumstances. Fortunately, the microfinance industry has become an integral force to help rebuild Sierra Leone's social, financial, and economic structure. When looking at the microfinance industry in a particular country, MIX Market is a helpful resource. A listing of the top microfinance institutions around the world, it gives a sense of the scale and impact small loans are making. 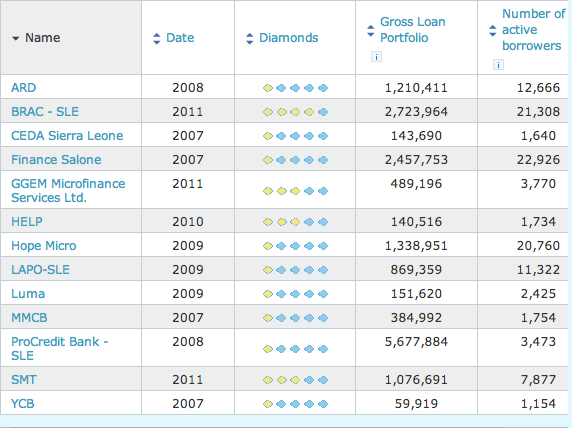 MIX tallies 33,000 borrowers (out of a population of 5 million) in Sierra Leone. All of the country's institutions on the index have a combined loan portfolio of $34 million, with an average loan size of $130. 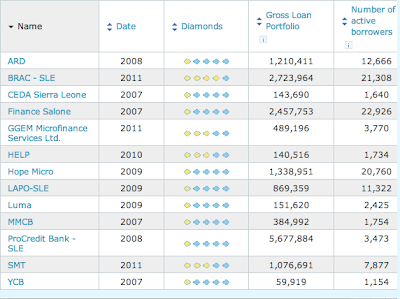 As of 2011, there were $4.3 million outstanding loans. Needs are being met, but there's still a lot of work to be done. 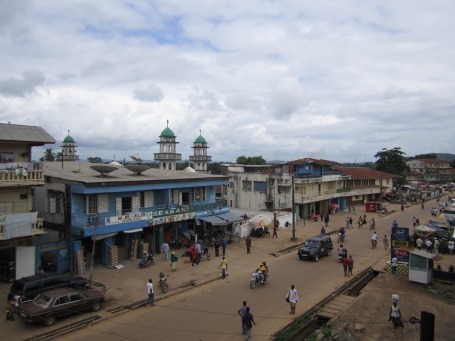 MIX Market features 13 microfinance institutions in Sierra Leone, and two of them are Kiva Field Partners: Salone Microfinance Trust (SMT) and BRAC Sierra Leone Microfinance Company Limited. As Sierra Leone rebuilds its infrastructure post-conflict, international aid has been key in injecting capital into its economy. The civil war led to massive devastation to the physical landscape, immense displacement of the population, and inescapable poverty with 70% living on less than US$1 dollar a day. These facts and statistics illustrate how important microfinance is in Sierra Leone, where many can't obtain traditional capital. In 2003, The Microfinance Investment and Technological Assistance Facility came to fruition, and has been successful in implementing large-scale change for rural and low-income citizens. Additionally, the Bank of Sierra Leone established a microfinance unit as a way to provide more access to capital and create social and economic equality. 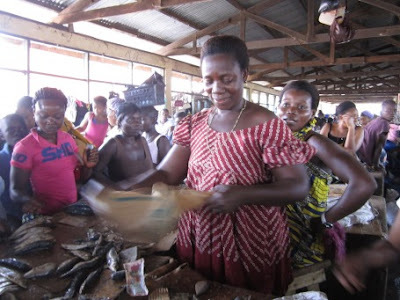 In Sierra Leone, microfinance has helped empower the underserved population by providing opportunity through loans. Borrowers are able to gain strength through knowledge, and in doing so, can expand economic activities, improve their quality of life, and reduce conflict. This is especially important for women, who, traditionally assigned to family duties, can escape patriarchal rule through financial training and self-employment. Through microfinance, the population of Sierra Leone has been able to slowly repair wounds from the past. Salone Microfinance Trust (SMT) is an independently-run microfinance institution founded by ChildFund International. Kiva has partnered with SMT for the past five years to administer loans in rural Sierra Leone. So far, 12,383 borrowers there have received $2,840,150 in Kiva loans. The average loan size is $231 and 63% of the loans have gone to women entrepreneurs. Kiva Fellow Micaela Browning is working in Makeni with SMT and has had an incredible experience. "SMT staff are some of the most dedicated and hard-working individuals," she says. "They are a veritable family of coworkers that consistently put their clients’ needs far above their own." BRAC Sierra Leone has been working in the country since June 2009, with 43 branches reaching over a quarter of a million the citizens. 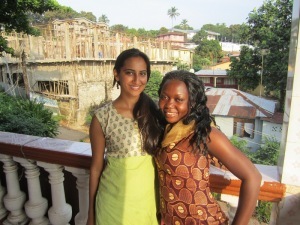 BRAC Sierra Leone started working with Kiva in March 2011. It has since administered loans to 304 Kiva borrowers totaling $274,300. The average loan size is $902 and 64% of loans were given to women entrepreneurs. Stay tuned to the Kiva Blog for the last post in this month's Passport Series about Sierra Leone. This is the second of a three-part series taking a look at the country's history with microfinance, Kiva's role in expanding opportunities for its citizens, and what it's like to participate in the country's economy as a borrower, lender and field worker. Questions? Comments? Email us at blog@kiva.org.